Two pies enter, only one pie leaves. We decided to put these two iconic department store recipes to the test. Since Eaton's Georgian Room is long gone (closed in 1976) & Simpson's Arcadian Court is now a private event space, we decided to conduct a little historical culinary research ourselves, by making & comparing the two iconic recipes. For Eaton's iconic recipe, we used Carol Anderson & Katharine Mallinson's research on the history of the Georgian Room in their book, Lunch with Lady Eaton. For the Arcadian Court, we used the version currently on the menu at Bannock, the new restaurant that occupies the ground floor of the old Simpson's building. Find the recipe here. But are both recipes just copy cats of the "original" department store chicken pot pie served at Chicago's Marshall Field's since 1905? Here's the recipe from Mrs. Hering that may have started it all, still on the menu at Marshall Field's iconic Walnut Room (now owned by Macy's). Found on tables from the Roman period onwards, a recipe for chicken pot pie is among the earliest recorded in colonial America and Canada. A basic Chicken Pie from Amelia Simmons' 1796 American Cookery. Courtesy of the Historic American Cookbook Project at MSU. A recipe for Chicken Pie from the Cook Not Mad cookbook, first available in Canada in 1831. Courtesy of the Historic American Cookbook Project at MSU. There was no shortage of offerings at the original Arcadian Court, including veal, boiled salmon, and lamb chops? But where's the famous chicken pot pie? The early origins of the famous dish might lie in the "Chicken a la King in Croustade" offered as part of the Arcadian Court Luncheon. Just a fancy name for pot pie in disguise? On February 2nd, 2017, O&B held a nostalgic dinner at the Arcadian Court, the in-store restaurant of Simpson's. Opened in 1929, the restaurant was a staple of luxury dining for most of the 20th century, even outlasting Simpson's itself! The space is now open only to private events & the occasional event like this one with great touches from the restaurant's past including chairs, silverware, and menus from the Court's noted past. But where was the iconic chicken pot pie? The Arcadian Court as it looks in 2017. Eaton's Georgian Room slightly predated the Arcadian Court, designed and opened by Lady Eaton herself in 1924. 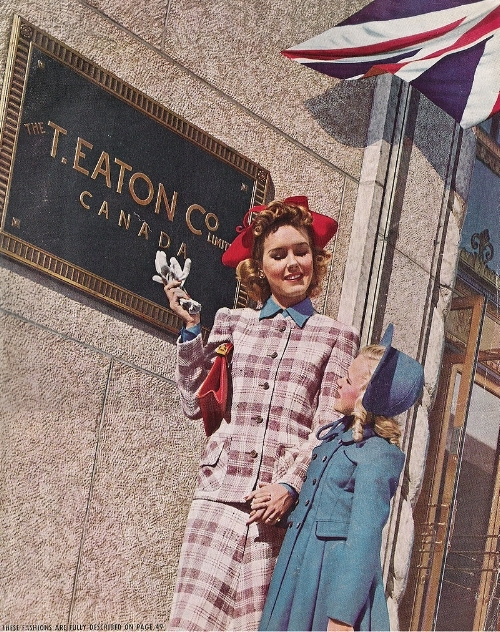 The room was modelled on the Georgian Room Restaurant in Harrod's of London & was a staple of power lunches & afternoon teas for Toronto's high society until Eaton's demolished its Queen Street store in 1976 to make way for the Eaton Centre Mall. Eaton's Georgian Room as it looked in the late 1930s. The demolition of Eaton's Queen Street store, home of the Georgian Room, in the summer of 1976.